If American flags were handed out to ten people and I was one of the ten, I would probably be the last of the ten to wave my flag. That said, every so often when hearing something I take as anti-American, I feel my hackles rise and my jaw harden. Sometimes, I surprise myself on how little it takes to raise my dander. As an example of “how little,” I give the following incident: This past spring we rented an old Dutch barge from an Englishman living in France. When the toilet on the barge mal-functioned, the owner said that our problems were probably the result of our (the American habit of) using too much toilet paper. Excuse me! Has someone studied this… run the numbers? Do Americans use more toilet paper than the British and the French? The insult hit me hard – I was ready to fight for my country’s honor. A more recent and serious example of my prickly nature is my response to the video posted last week by Mother Jones magazine. If you haven’t seen the video in its entirety or you have heard/read only clips, you can view the entire video by clicking on: http://www.motherjones.com/politics/2012/09/secret-video-romney-private-fundraiser. My anger spills past partisan politics. My anger, a spring run-off torrent, runs to the very real insult of the working poor. I am offended, not as a Democrat, but as an American. Surely, Romney’s way is not the American way. Perhaps Romney has not had the advantages I have had. Unfortunately, Romney has never worked in the field of social services: he does not have a clue as to how “THOSE PEOPLE” live. Based on my personal experience, the working poor, the under-employed, and the unemployed who would like to work but cannot find employment have not chosed to live on the margins. Contrary to Romney’s view, they are not moochers taking their ease with their hands out. Rather, the flat economy, automation, health issues, age and their 20th century, out-of-date skills have consigned them to redundancy. As for Romney’s inflated 47 percent, let me reference the Congressional Budget Office. 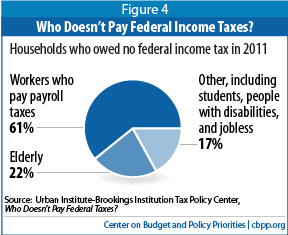 According to Tax Center Policy data, only 17% of households did not pay any payroll or federal income tax in 2009. Those who did not pay federal taxes were the elderly, the disabled, students, and also people who had been unemployed the entire year and could not find work. (As a side note, even those people who were exempt from paying federal tax because of the 2009 Recovery Act, were not exempt from state and local taxes. Also, to off-set the burden of Social Security taxes and to maintain an incentive to work, the Earned Income Tax Credit (EITC) refunds money that low-income workers have paid into the system. To view the breath of the entitlement programs, see http://www.irs.gov/uac/The-American-Recovery-and-Reinvestment-Act-of-2009:-Information-Center. In closing, I apologize for the lack of photographs and pie graphs that I had planned to include. For whatever reason, the WordPress download photos function seems to have frozen. Hopefully, on my return tomorrow or the next day, all will be well. This entry was posted in Uncategorized and tagged "Those People", 47%, Mitt Romney. Bookmark the permalink. Bro and I used to laugh at the the stingy use of paper products in the old country compared to the american way in the wc so there might be some truth in the barge man’s comment. Wonder what Mitt Wrongly thinks about this. To be perfectly honest, I think that Americans do use more paper – probably because paper is cheaper here than in many places. It was silly of me to take offense when Nigel’s words were so true. My taking offence is just an example of how thin-skinned we are when our country is up (even deservedly up) for criticism.